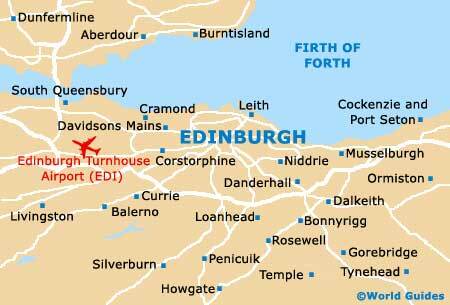 Edinburgh is a city with extremely lengthy religious roots and visitors will soon discover that many of the oldest buildings are in fact churches. People come to the city's churches and three cathedrals for a variety of different reasons, with some looking for a peaceful place to pray, while others simply come to admire the beauty of the architecture. 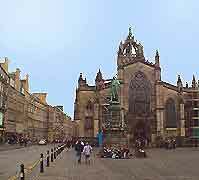 Also known as the High Kirk of Edinburgh, St. Giles' Cathedral stands on the Royal Mile and dates back to the 12th century. Its eye-catching crown steeple makes this structure easy to spot on the skyline. St. Mary's Episcopal Cathedral is roughly a ten-minute walk to the west, via Johnston Terrace and West Maitland Street, while standing near to the St. James Shopping Centre and Regent Gardens, the Metropolitan Cathedral of Our Lady of the Assumption serves as the seat of the Archbishop of Edinburgh and St. Andrews. St. Giles' Cathedral is one of the most important religious buildings in Edinburgh and there has been a church on this site for almost 900 years. This impressive cathedral was destroyed in the late 14th century and rebuilt shortly afterwards. Declared a Presbyterian cathedral by Charles I in 1633, many parts of St. Giles' have been rebuilt, remodelled and restored over the years, adding true historic character to this grand structure. Notable attractions include splendid architecture, a stylish pipe organ with a glass panel at the back, hand-carved wooden stalls, the rather grand Chapel of the Knights of the Thistle and regular services. Designed by George Gilbert Scott, the Cathedral Church of St. Mary the Virgin is located on the western side of the city centre. Construction of the cathedral began in 1874 and whilst the nave was opened just five years later, the twin spires on its western side were not actually completed until 1917. Highlights include impressive neo-Gothic architecture, well-preserved stained-glass windows, murals and an outstanding art collection, as well as daily choral services. This popular Roman Catholic church dates back to 1814, being designed by James Gillespie Graham. Each month on the third Tuesday, look out for the organ and choir recitals. The adjacent Cafe Camino provides a rather tempting menu, offering bacon sandwiches, freshly made soup, lunchboxes for children, a choice of beverages (including coffee, tea, wine, beer and cider) and tubs of locally produced ice cream. The Magdalen Chapel dates back to the 16th century and is renowned for its superb ancient stained-glass windows. Built by Maichale MacQueen, this church has recently been renovated and can be found in the Old Town area, where it is just a short walk away from the Edinburgh College of Art. Greyfriars Kirk, formerly the site of an ancient Franciscan friary, dates back to 1620. Severely damaged by fire in 1845, Greyfriars features a small visitor's centre with information relating to the church's lengthy 400-year history, including a display about the National Covenant. 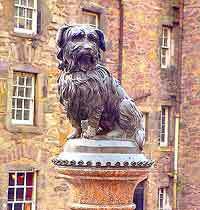 People come here to view the original portrait of Greyfriars Bobby, a dog owned by John Gray who, after his master's death, sat watch on his grave for around 14 years. Situated in the city centre, the historic Church of St. John the Evangelist was built almost 200 years ago. This grand structure is one of the few buildings on Princes Street that blocks the view of Edinburgh Castle and after it was built, an Act of Parliament was passed, preventing further development in this area. The church stands on the corner of Lothian Road and features large neo-Gothic stained glass windows, sculptures, tapestries, paintings, a library, a coffee shop, a bookstore and regular concerts by the resident choir. Mansfield Place Church is to be found within the New Town area, standing close to the bus depot and the King George V Park. Built in 1872 by Robert Rowand Anderson, this old church has had many uses over the years and once even functioned as a nightclub. Today, it is owned by the Mansfield Traquair Trust, a conservation group who have actively restored the building over a number of years. Mansfield Place Church is now regularly used as a popular venue for exhibitions, concerts and theatrical events, rather than as an actual place of worship. Built in 1835, St. Mark's Unitarian Church is situated on the southern side of the city, between Waverley Park and the Newington Cemetery. This important Victorian church holds regular classical music concerts and recitals throughout the year, particularly during the Edinburgh International Festival each summer. St. Cuthbert's stands alongside the West Princes Street Gardens and just up from the Royal Lyceum Theatre, where it was built on the remains of six previous historic churches. Visitors will be able to admire a stunning marble pulpit, colourful stained-glass windows, war memorials and an Italian Renaissance-style interior. Officially named the Collegiate Chapel of St. Matthew, the beautiful Rosslyn Chapel is located to the south of the city, being found within the neighbouring Midlothian village of Roslin. This ancient medieval church was built in the mid-15th century and features highly detailed stone carvings, exhibitions, a shop and a café. The Canongate Kirk is situated within the Old Town area of Edinburgh and is a particularly attractive building, being located just across from the Museum of Edinburgh and close to the university campus. This church serves as the place of worship for the Royal family when they are staying in the area and is steeped in history. Built in 1688, attractions include stunning architecture, classical music concerts and choir recitals. Located on the north-eastern side of the city and close to the Leith Campus of the Queen Margaret University College, the Hindu Mandir and Sanskritik Kendra was previously better known as St. Andrew's Church. This temple is now one of the city's most successful community centres and regularly plays host to a series of lively festivals throughout the year.